‘Leading the Way, Not Managing the Day’ is a volunteer management conference presented by AL!VE, Better Impact, and Volunteer Management Professionals of Canada (VMPC). 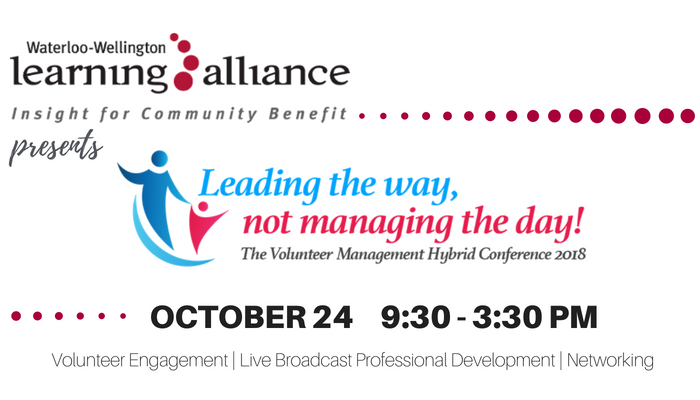 Now in its fourth year, this year’s topic will explore how leaders of volunteers can move from managing to LEADING. The streaming event will consist of a 30 minute presentation followed by a moderated discussion with the other presenters (think TED talk meets late night tv), including responding to questions from the audience. This training, titled ‘Leading the Way, Not Managing the Day’ will focus on developing management and leadership skills for those who work with volunteers, service delivery programs, and non-profits. This unique hybrid event features three internationally known speakers who will present ideas and solutions for developing leadership within their volunteer cadre and for the volunteer engagement professional, or those who work with volunteers. 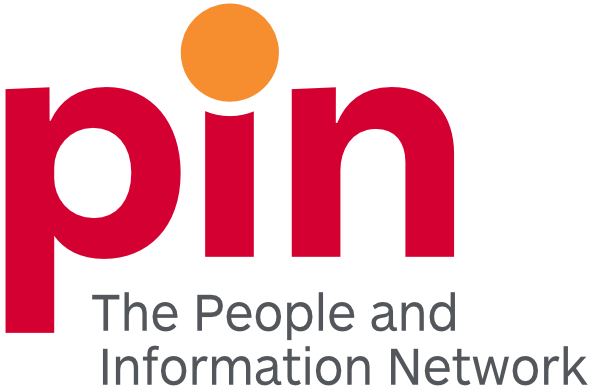 The training presentations will be broadcast live in 40 remote locations across North America on October 24 with discussion and networking at the local level; the Waterloo Wellington Learning Alliance is pleased to bring this unique learning and networking event to our local area. The streamed portion is hosted by Dana Cory Litwin, CVA is a San Francisco based transformational coach, strategic advisor, and public speaker with a background in team building and environmental conservation. Dana will lead discussions with the presenting team and facilitate the international discussions via twitter and the live-stream feed. Heidi Jakop, CVA will share examples, steps, and opportunities for cultivating and empowering leadership in your volunteers and engaging a diversely talented team. Drawing from the Servant Leadership style, she will also explore creating the conditions and environment that allow volunteers to shine. Heidi is the Director of Volunteer Engagement for Vancouver Botanical Gardens Association. Heidi is the President of the Administrators of Volunteer Resources of BC. Heidi was most recently and instructor at Langara College for the Volunteer Coordinator Certificate Program and facilitates workshops and webinars for university, municipality, volunteer centres, and professional associations. Beth Steinhorn, President VQ Strategies will use real-life examples and share tips on how to get a seat at the leadership table and shift from managing volunteers to instead, serving as an internal consultant to support staff from across the organization in effectively engaging and supporting volunteers. Beth partners with organizations and their leadership to increase their impact through strategic and innovative engagement. The author of multiple books and articles on strategic volunteer engagement, she is a popular speaker and trainer, known for her interactive and inspiring presentations. Angela Williamson, CVA, will bring ideas and take away points that the learner can implement that moment or the next day to either save them time, create larger capacity of volunteering in their organization, or empower them to add volunteers in their own work. Angela has been the volunteer manager at Hagley Museum & Library in Delaware for 11 years. She has been the president of the Delaware Association of Volunteer Administrators (DAVA) four years and supporting in other roles in other years. She worked in education at a public garden prior to Hagley. She loves pursuing and promoting volunteers as an important role in society. Angela comes from the US Midwest of friendly people.